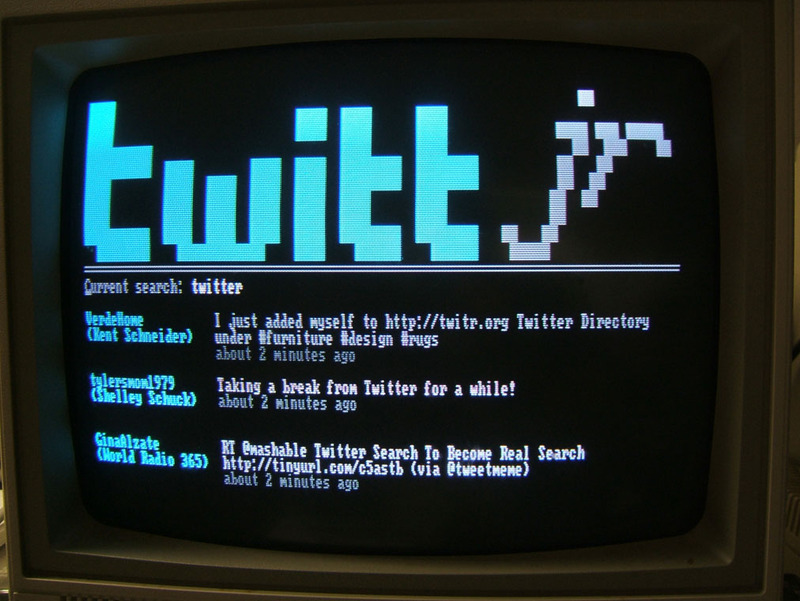 GitHub - grantovich/twittjr: Twitter search client for the IBM PCjr. Twitter search client for the IBM PCjr. Want to be notified of new releases in grantovich/twittjr? 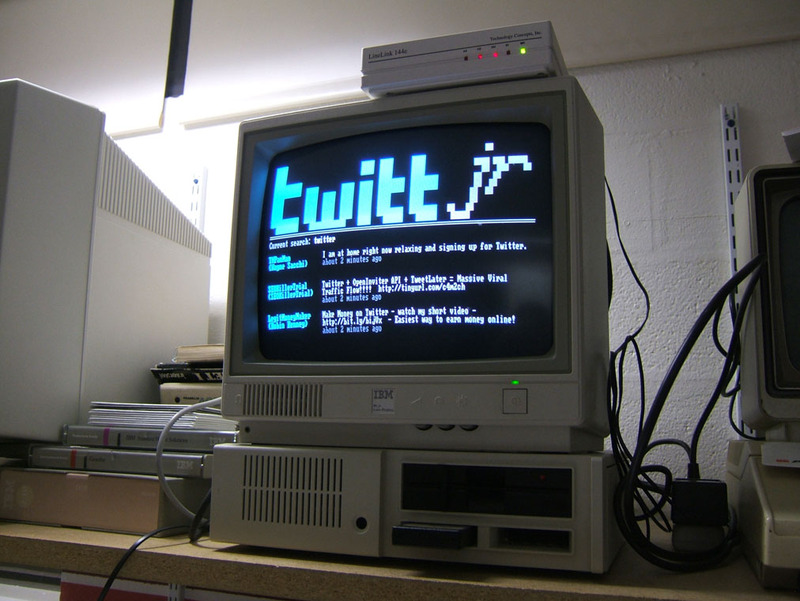 Twittjr is a system that displays a pseudo-live feed of the most recent public tweets for any given search... on an IBM PCjr. In my second year at RIT I discovered a fully-functional IBM PCjr gathering dust on a shelf in the Computer Science House server room. Noticing it had a variant of BASIC, one of the first languages I ever learned, I thought I'd write an eye-catching program that would attract people to our tables at ImagineRIT 2009. Lots of CSHers had been joining Twitter recently, and someone who saw me fiddling with the PCjr jokingly suggested putting Twitter on it. So I did! You have a PCjr hooked up to an external dial-up modem, which is connected to a phone line. Elsewhere, you have a modern internet-connected computer with another dial-up modem, connected to another phone line. The PCjr dials this "server" and establishes a modem connection, which it uses to send a request for whatever search term the user enters. The server uses the Twitter Search API to download the three most recent posts on the public timeline that match the search, and sends them back over the phone line to the PCjr, which displays them on the screen in glorious 16-color ASCII-vision. In the absence of user interaction, the PCjr refreshes the search results every minute or so, providing a "live" feed. Make sure both of your phone lines have dial tones and one can call the other, then hook up your modems. Place twittjr.rb on your server and ensure ModemDevice is correct. Place TWITTJR.BAS on your PCjr. If using the internal modem, change COM1:1200 on line 100 to COM2:300. Read the comments for additional tweaks that might be necessary. Boot your PCjr with Cartridge BASIC in a cartridge slot and PC DOS disk in the drive. On the PCjr, run basica twittjr.bas. Provide an initial search term or press Enter for the default. On the server, run ruby twittjr.rb. Both the PCjr and the server should be asking whether to use answer mode. Choose yes on one of them, then choose no on the other and enter the appropriate phone number. Modem noises will occur. If the connection is successful, the server will report "Connected!" The PCjr will auto-refresh the search results about once a minute. Press F3 on the PCjr to enter a new search term. Press F10 on the PCjr, or Enter on the server, to close the connection. This setup is not completely reliable, so the first thing to try is to "try, try again". I've had quite a number of inexplicable failures that seemingly fixed themselves on the next attempt. Note the requirement that your server's modem must be accessible as a serial device. On Linux, you can test this with screen /dev/ttySx. On Windows, PuTTY has an option to open a serial connection. Keep in mind the vast majority of internal PCI modems are "softmodems" that require vendor-specific drivers to function, which may only exist on Windows. In the BASICA editor on your PCjr, entering TERM on a new line will load a simple terminal applet you can use to send modem commands. Note this will replace your currently loaded program. The basic modem command AT should return OK if your modem is working correctly. See here for additional commands.